Since 2009, Mensa Czech Republic has realized a project called “Mensa NTC Learning System” in the Czech Republic. This project is aimed at the development of the intellectual powers of all preschool children (not just the gifted ones), and was developed by an expert team from Mensa Serbia, led by Dr Ranko Rajović. Dr Ranko Rajović is a long-term member of the four-member committee of International Mensa for gifted children. He has set up a team of experts in pedagogy, neurophysiology, defectology, psychology, and genetics – and together, they have developed an efficient and simple programme for preschool children, which can be continuously assessed and evaluated. The advantage of this concept is its application for children aged between 3 and 7, resulting in the better development of intellectual powers in each child. Just the fact that the human brain develops over 50% of its capacity before the age of five is reason enough to apply specialized programmes as early as possible. It is the responsibility of society, local communities, and each parent to not miss this extremely important period in life and to support the development of the biological potential of each child to his or her maximum. Among others, the NTC learning method involves the recognition of abstract symbols, country flags, or car brands, and puts emphasis on divergent thinking, enigmatic stories, and enigmatic questions. Mensa Czech Republic has obtained accreditation from the Czech Ministry of Education, Youth, and Sports for a specialized training programme aimed at preschool teachers. 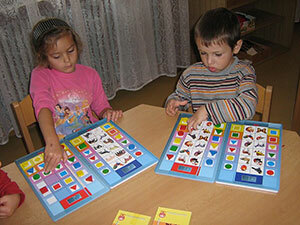 A few examples of Czech kindergartens applying the NTC learning method are given in the left menu. Please note that a comprehensive overview of all of them is currently only available in the Czech version of this website. The following map shows the current distribution of all NTC Kindergartens in the Czech Republic.